lITTLE cOLLINS sTREET KITCHEN IS LOCATED on the first floor of THE SHERATON MELBOURNE HOTEL, one of Melbourne's finest 5 star boutique hotels at the stylish 'paris end' of the cbd. 163 guest rooms, 11 Terrace Suites, an indoor heated lap pool, luxury spa, state of the art fitness centre and the open air Terrace Bar, make our hotel the perfect excuse to stay the night after a meal at Little Collins Street Kitchen Restaurant. 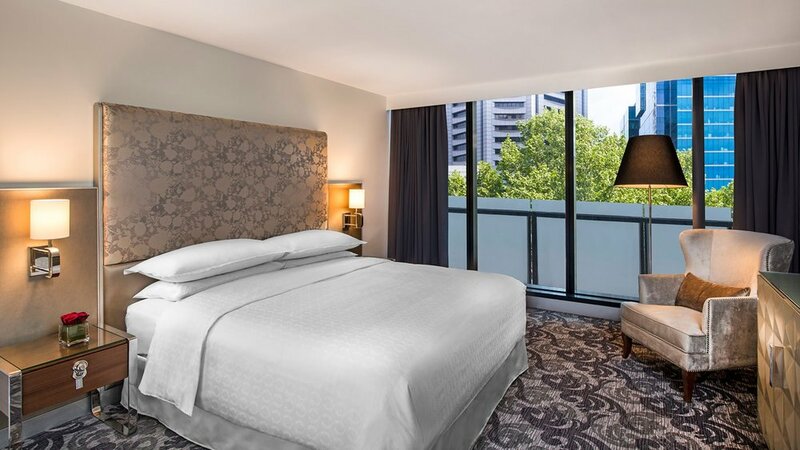 Below is a sample of the many room types available at Sheraton Melbourne Hotel. The Traditional Guest rooms are generously sized at an average of 35 square metres. The rooms are styled for a relaxing retreat from the buzz of the city. Each Traditional Guest Room comprises of a Twin, or King bed configuration and features a modern marble bathroom with separate bath and rainforest shower. Generously sized at an average of 38 square metres, our quiet Deluxe rooms feature a stylish décor with natural tones. Designed with discerning business and leisure travellers in mind, each Deluxe Guest Room has an oversized full marble bathroom with separate bath and rainforest shower. These rooms are available in Twin or King Bed configurations. The Executive Terrace Suites are designed to provide you with all of the comforts of home with a luxurious and modern touch. With floor to ceiling windows, located on floors 4 - 7 the room comprises of a King bed configuration, featuring modern marble bathrooms with separate bath and rainforest showers. The suite can convert into a 2 bedroom, interconnecting to the adjacent superior room charged at the Superior room rate.